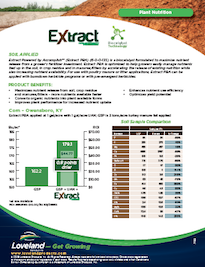 Extract Powered by Accomplish™ (Extract PBA) is a biocatalyst formulated to maximize nutrient release from a grower’s fertilizer investment. For use with poultry manure or litter applications, Extract PBA can be applied with burndown herbicide programs or with pre-emergent herbicides. See how the biocatalyst technology in Extract PBA improves corn yields and nutrient availability in these poultry manure and poultry litter trials from Kentucky. Simply fill in your information to access the study.